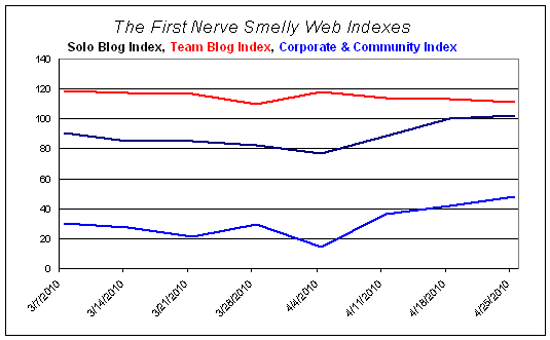 The Solo Blog Index continued to climb with a 3-point rise although declines outnumbered advances two to one. FirstNerve snapped its totally awesome unprecedented streak of fifteen straight weekly gains with a drop. We blame the short-sellers and call for global controls on smelly web traffic. 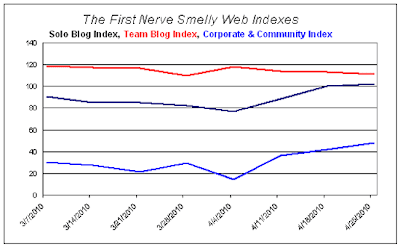 The Team Blog Index was again off one point, but the Corporate & Community Site Index followed last weeks five point rise with a six point gain, with TheDryDown leading the way. I made a killing on my First Nerve short positions. Long live the Smelly Index! But yeah, it does look like Spring has brought new attention to the solo blogs. Lots of new releases, plus the pent-up urge to spend after a dreary winter of recession talk (? ), seems to be driving traffic to the info & opinion pages. Not usually a commentator ~especially to stats, they speak for themselves, don't they~ but it seems to me that there have sprung too many blogs over the years (everyone and their chimp has one, no offence to chimps!) so it's perfectly natural that interest will be diversified and attention span from readers will be short. Nevertheless, steadily steered venues have more or less of a steady readership and lots of Google-directed traffic, often focusing on searching for specific opinions on what one might have heard elsewhere. This last bit might explain the rise and decline of the Solo Blog Index stats i.e. dependency on peripheral newsfeed on new releases accounting for internet buzz: You read a reference or announcement of a new product someplace and then you search for some actual opinion on it from someone who (apparently) knows their marbles and rise beyond the press release. On another note, got a kick out of the bourgeonal issue ~couldn't resist if wild horses were pulling me~ and wondered whether Donner Babcock (what's in a name) finally came to a conclusion about where the attracting essence comes from. Last time checked [health24.com] the team wasn't sure. Additionally, the info on undecanal actually blocking the sperm cell receptors, otherwise so friendly to bourgeonal, is a finer point that might be useful in the advancement of actual products of an aromatic nature in the contraception/fertility stakes, wouldn't you think? Congratulations. You can cash out your positions at the Department of Internet Money. Have you considered refining your hypothesis? If new launches drive traffic then the uptick should simultaneous in sites in the northern and southern hemispheres. On the other hand, if season (warmer post-winter weather) drives the effect then northern and southern hemisphere should show opposite trends. I share you general view of blog traffic. That's why I split the Indexes the way I did. I figured solo blogs would be "noisier" statistically since it's hard to maintain high-quality, high-frequency posting. Solo blogs are like open-mike night at the roadhouse. Some duds, some passable, and the occaisional winner. Group blogs may have a steadier mix of posts and thus reflect long-term traffic trends more clearly. Ditto corp & comm sites. Finding molecules ("ligands" in biology terms) that stimulate or inhibit receptors is key to drug development. The same logic applies to "tuning" the response of human olfactory receptors and thereby changing how we smell the world. Wanna experience the world like a rabbit? Sniff this inhaler. Might be possible one day. But since your Smelly Web Index is so new, I wonder if current global recessionary pressures will wreck havoc on the data until (or if ever) the pressures ease? Maybe you launched during one of those moments in a long-term chart that a statistician would ordinarily discard. How would a statistician correct for launching during an anomaly?